Posted by Toy Lady in Cooking, Food, soupe du semaine, Surly Boy. I have never seen The Exorcist. Yeah, I know. But really. So anyway, I have therefore never really had any, uh, issues with pea soup. I actually love the stuff. Peeps, on the other hand, has seen that movie, and he had never had split pea soup. Not ever. Well, this is just going to have to be remedied, doncha think? All the stars are aligned, and it’s time this week for a nice pot of basic split pea soup with ham. (After all, what’s pea soup without ham? Lame, that’s what.) So as I said, everything is in place – and the weather forecast is calling for the “possibility” of snow this week. 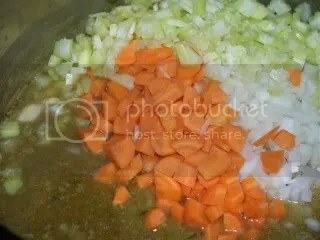 We’ve always got your basic soup vegetation (onions, carrots, celery – mirepoix) on hand. Chicken stock – of course. There’s even half a quart (also known as a pint) of our smoky “poultry stock” in the fridge that needs to get used up before it’s too late. Ham – check. 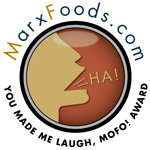 Last summer, during one of his manly-man smoking sessions, Peeps threw a few dinner-sized slices of ham on the smoker to make some smoky ham spread, based on another recipe for roast beef spread. 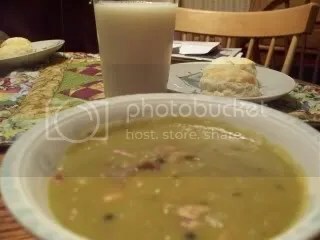 I snagged the bones, still attached to some sizable hunks of ham, and stashed them in the freezer, and that, along with a small package of country ham slices from Burger’s Smokehouse, would be exactly what I’d need for a nice pea soup. Pretty much any nice soup, actually. Now my biggest question is whether to go with some nice mixed beans or split peas? Given the fact that my poor, dear husband has obviously been split pea-deprived, and I haven’t had pea soup in, well, I couldn’t even tell you how long, I decided to take a chance and expose him to something new and exciting. Besides, it’s got HAM in it. Of COURSE he’ll love it! 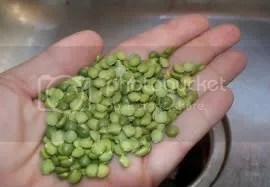 So I picked up a pound of dried split peas at the grocery store. We’re good to go. So we’re making pea soup. Here’s the printable version. 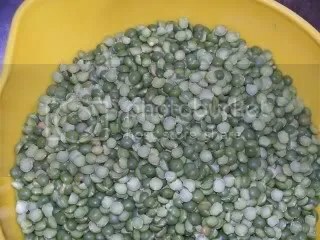 Because dried split peas, like dried beans, are an agricultural product, the first thing we always do is sort through them and rinse them, making sure there are not stones or dirt or other bits of nature mixed in them. Then, of course, we rinse the peas. 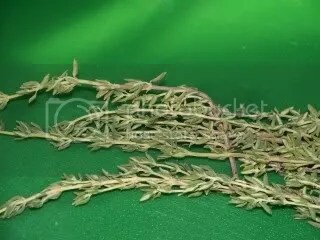 We needed some fresh thyme for something else earlier in the week – I don’t recall, now, what we needed it for, but, after an entire season of being herbally self-sufficient, we actually had to go out and buy fresh thyme. 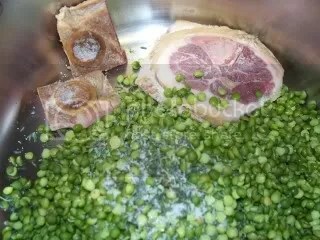 Into a soup pot (or Dutch oven) dump your pound of cleaned, rinsed peas, a Tablespoon of chopped fresh thyme, a teaspoon of kosher salt, a couple of Tablespoons of whole peppercorns, and a few bones from ham slices (or a ham hock or a whole ham bone – whatever you have). 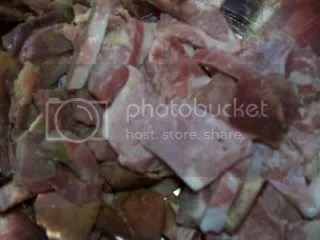 Take the meat from the ham slices and dice it and set it aside for a little later. Add 2 quarts of liquid. That would be 8 cups. 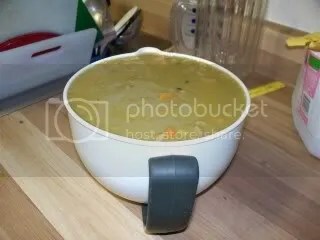 You could use all water, or you could enhance that with a couple of cups of chicken stock, like I did, if you want, but remember this is a pea soup, not a chicken soup. I’m just saying, that’s all. Cover and let simmer for an hour. Meanwhile, chop up a couple of onions, a couple of carrots, and a couple of ribs of celery. After an hour, toss the vegetation into the soup and continue to simmer until the veggies are softened and the peas have really started to break down, about another half hour or so. Pull the ham bones out and (as soon as it’s cooled enough to handle! 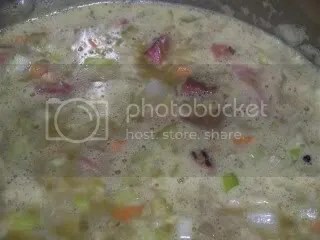 ), cut any meat off the bones and, then return the meat, along with the set-aside diced ham, to the soup. Bring the whole mess back to a boil and let it cook down some more. It should only take about 10-20 minutes until a few things happen. The meat will be heated through. The veggies will be cooked through and soft. At this point, we transferred the soup to a container and stuck it in the fridge until later in the week. It, uh, made about two and a half quarts, plus a little. So we stuck the soup in the fridge for a day later in the week. Then, on the morning of that later day, Surly Boy called me at the office. He wanted to know if it would be OK if he came by that evening to do a load of laundry. Oh, the joys of having a “grown up” kid. So he came by, and he was still there at dinner time. And you know how cranky we old people get if our dinner is late, so I made him stay and eat. Well, along with the ready-to-bake biscuits that accompanied the soup, it seemed to be a hit. Surly Boy, after sampling the soup while we were heating it, decided that his laundry “wasn’t dry enough” and was happy to join us for dinner. Peeps, who had never had split pea soup, decided that we are GOING to do this again. Soon. And me? Well, I may have mentioned, I love pea soup. This was especially good, I thought. It may be because it’s been so many years since I’ve made pea soup. Or it may be the combination of super-smoked ham, attic aged ham, and smoky poultry broth. Or maybe it was just nice to have Surly Boy actually relax and enjoy dinner with us. I don’t know, but it was really frickin’ good. And it was just as good reheated for lunch, too. YUM. You and I are alike between the beet and now spit pea soup. Time for me to make some soup I guess. I make a pretty reasonable potatoe/corn soup using a double boiler. You apple picking looked like as much fun as my raspberry picking. It really it fun to get out and do it. I’d love to hear about your potato & corn soup, too – I’ve never used a double boiler, but I’ll bet you have much more control over the temperature that way, wouldn’t you?